The following specifications apply to R.C.W cabinets. Custom designed units to your specifications are available in your choice of design, woods, or finishes. 1. 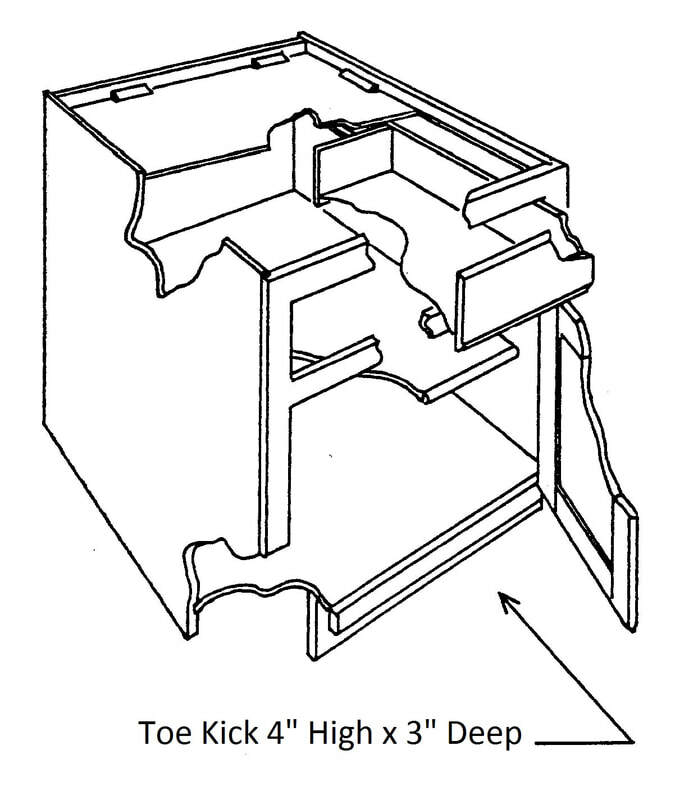 ​SIDES, TOPS and BOTTOMS: 3/4" select plywood-machined to enter groove in cabinet facing and to receive bottoms and backs. 2. CABINET FRONT FRAMES: 3/4" solid lumber, 1-1/2" wide stiles and rails with mortise and tenon construction, glued and pinned from the back and machined to receive the cabinet sides. 3. DOORS: 3/4" thick select solid lumber on raised panel doors. DRAWERS: Fronts are 3/4" solid lumber with raised panel doors. Exposed dovetails for greater strength. Sides and backs are 3/4" solid lumber grooved to receive bottom for strength and rigidity. Bottoms are 1/4" 5 ply plywood. 4. DRAWER SLIDES: Drawers glide on self-closing concealed Bluemotion drawer slides.. The slides are soft-closing for finger-tip operation. 5. ADJUSTABLE SHELVES: 3/4" thick. Shelves are adjusted by means of drilling into the sides of the cabinet and supported by self-locking shelf rests. 6. CABINET BACKS: 3/4" plywood, entered into recess of cabinet sides. 7. A fine selection of hardware is available. 8. FINISH: Cabinets are finished in an assortment of natural wood finishes. Hand wiped penetrating stains, followed by a sealer. When dry, the sealer is sanded and the top coat (conversion varnish) is applied.